"Customer Service is a dream"
I can only speak for the payroll specialist I have worked with, Priscilla Proch. She is ALWAYS kind, which is KEY, however she is also extremely informative and lovely to work with. An asset to the company on all levels. Recently when I have entered payroll and then navigate off the page, some of the data has been lost, however I have fixed that by periodically navigating off the page to save so I don't time out, even though the time I am on that page does not seem enough to lose data. Call and talk to different payroll companies and make sure you choose one with your OWN Payroll Specialist. That has been amazing as many other companies give you a number to call and it is almost impossible to reach anyone and then you have to explain your whole situation to each new person on the phone. Heartland helps create peace of mind around payroll processing. Shelly, thank you for taking the time to leave us a great review, and the kind words about Priscilla! "Best Payroll Management Company Around"
Their Graphical User Interface. It is very easy to use and is laid out in a logical manner. I do not really dislike anything about the service. However, I do find some (very few) of the help screens to be lacking. I think that Heartland Payroll Systems is the best payroll management system we have ever used. I find they responsive, knowledgeable, an very professional. Any changes in the system are reported. Downtime for system maintenance is never during our normal working day and communicated well in advance. Heartland takes the worry out of all my payroll needs. They ensure that my payroll is submitted on time and that it is correct. Any updates to tax rates, etc. are taken care of automatically. They interface with my states Division of Revenue as well as the Department of Labor and the IRS. This frees my time up to run my company. "More bells and whistles than I need but a great service"
My sales rep is still on the job and available for my calls even 3 years later! He's my go-to support when I can't figure out something I'm trying to do. Talking to support at Heartland is helpful if you get someone helpful. It's not a user-friendly service for a non-HR, non-accounting person. When I started with Heartland, my bank integrated with my accounting system (Xero) and doing payroll was much easier. Then my bank changed to a 2-step online validation login, and it broke my connection to Xero, which meant it broke my connection to Heartland, too. Now I have to do my payroll manually, and the reporting is not easy to understand. However, I plan to either change banks or accounting systems this year, and then the Heartland interface should work again. So none of this is really Heartland's fault. Try to work with a rep who has a long history with the company and/or experience in payroll/HR. Like most online companies, they do most of their support by chat/email, altho they're pretty good about voice to voice if you call in. When I signed up with them, I'd reviewed 2 other payroll companies in addition to Heartland. I liked that Heartland had a local rep and he seemed very knowledgeable. My first account exec was very responsive and helpful. But he got promoted and now I'm not impressed with his replacement. She's actually making my job harder. So I reached out to my sales rep to ask to be switched to someone else. That is still in progress. But it's a huge undertaking to move financial accounts, so I'm going to try to make this work before looking around again. Heartland is fast, efficient and always does great work. They don't make mistakes and are very helpful when we have questions or any special needs. I've had issues setting up new employees and questions about court-ordered wage garnishment, for example. I always get fast answers and the right answer from Suzanne Slagle, our specialist. Even on the rare occasion that Suzanne is out, the other specialists step right in to assist. My only complaint is that the quarterly reports seem to take awhile at times to be uploaded but it's not a big problem. It's a fantastic service and I couldn't recommend it more. Our specialist is fantastic and always has answers. Using Heartland has made our payroll much simpler for me. Deductions and benefits are tracked in Heartland's system which gives us a check to validate our in-house tracking and also offers a back-up in case something would happen to our records. It's very easy to set up new employees and to change employee information, such as new address, new salary or deductions. Amber, we are thrilled to hear about your 5-star review of our service and payroll. We'll pass along the kind words to Amber and the other customer representatives, along with the recommendations on quarterly billing. Thank you! The fact that I have a dedicated payroll specialist, and when she is out, another one steps in, introduces himself/herself, and the ball keeps rolling. The fact that I get an email reminder and that I can process my payroll either through email or worst case scenario, phone. I have nothing to add here as I do not dislike anything about their service. It is a very affordable payroll service. I don't need to worry about paying all the payroll taxes. After payroll is processed, they let me know how much I need in the bank to meet payroll. I have access to payroll reports to meet my workman's comp audits. Thank you for the review about the excellent customer service, Tony! "If I Had Only Switched Sooner . . ."
I love the accuracy of my payrolls, the helpfulness of my payroll specialist, and the ease it has been to get our checks cut. I run a seasonal business without about 600-700 employees, and I had literally been in tears trying to run payroll with the payroll company I had before Heartland, which happens to be one of the largest payroll companies in the U.S. I honestly can't think of anything that I dislike. When the sales rep that I had at Paychex left and went to Heartland, I saw the writing on the wall. Joan Kurtenbach has been such a knowledgeable resource about everything regarding payroll, and I don't know what I'd do without her. The only complaint I have is that I did not receive my W-2s by January 22nd. I had to call on January 28th, and they still have not been mailed. They did overnight them to me right away, but i'm not sure what happened there. I would definitely recommend Heartland over Paychex or ADP. 1) I am solving soooooooo many errors that Paychex would make every single season. 2) I am saving money versus my former payroll provider. 3) I am realizing the greatest benefit of being less stressed about payroll. 4) I am receiving personal service, every time I call, and I'm not stuck leaving voicemails with people who don't get back to me. Thank you for the 5 ⭐️⭐️⭐️⭐️⭐️review, Dawn! "Great Pricing For The BEST Payroll Service"
The account representatives that I have had in my many years with Heartland have totally validated my switch from PayChex, who I left because they screwed up my payroll and while they fixed their errors, they refused to help me with the additional accounting fees that I had to incur to correct my returns. Heartland has been there all the way for me, quickly and accurately reporting all of our data to the proper authorities and my A/Rs have been insightful, thorough, very enjoyable to talk to, and have been as if they were inside my head because they got to know me and how I think. They take my business personally as if it were their own. They make Heartland one of the best choices I have ever made in business. Give these folks a try if you want someone who is invested in your business success. When I erroneously reported earnings for an employee, Heartland took the lead with getting everything corrected with the IRS. When the forms were returned for a missing check mark, Heartland took care of refiling for me at no additional cost. The reporting that I get from Heartland is so easy to access and understand that I wish they could do more for me. Neal, thank you for taking the time to leave us such a great review! We're of course thrilled that you are enjoying the accuracy of our products and professionalism from our account reps. Glad we could help you out with the refiling process and getting you squared away. Thank you for being a loyal customer these past few years. We really do appreciate your business, and look forward to many more years together. "10 Years of Excellent Customer Service"
We find little to dislike about Heartland. Perhaps, that our issues can take a little time to resolve, as opposed to instantly. You have your own Payroll Specialist. They make sure your payroll is complete and accurate. Heartland Payroll resolves all of our Payroll needs -- from making sure the Payroll is complete to filing our taxes and providing quarterly and year-end reports. The primary benefit we have realized is the above-and-beyond customer service. Having our own Payroll Specialist is the greatest benefit. Thank you for the ⭐️⭐️⭐️⭐️⭐️! We switched to Heartland because of its reputation for great customer service and we have not been disappointed. As a small company with limited bandwidth and experience with payroll, we needed a company to rely on not just to process payroll, but to answer our questions. I am somewhat disappointed that I am now on my third payroll specialist in 2 years as I loved my first one. That said, I wasn't disappointed in my new ones' performance. I just wondered what was going on in regards to turnover at the company. Heartland allows us to NOT spend time worrying about payroll. We have saved significant money by making this switch and have gotten access to a lot more information quickly on the interface than we did with our previous provider. When I have questions or concerns, Heartland is extremely helpful and knowledgeable. I have not had any negative experiences so far. Prior payroll service we used was terrible so this is very refreshing! Hiring the services of a payroll company is scary. You are entrusting them with all of your banking information, employee social security numbers, etc. You are also counting on them to file the state and federal payroll taxes properly. It's a big deal to choose a payroll service but I could not be happier with Heartland. I have already recommended Heartland Payroll to several other people! We use Heartland for payroll processing only. It's very nice to have a payroll company that I feel confident in. They are very knowledgeable and very helpful. Whenever I have a question, they respond quickly. "Easy platform to navigate with great customer service"
Not only is the site to enter payroll easy to navigate the customer service that is provided is top notch. Whether it is a simple question about the use of the site, challenges with entries or user error the support and response by Heartland Payroll Specialists are thorough and timely! Downloading reports is sometimes a slow process, however that may be attributed to slower download speeds on our network more than a platform issue. We use Heartland for payroll services the ease of the system is great. And the fixed expense is appreciated. Great to hear. Thank you for the review, Rose! That when I'm traveling I can still log in and do the payroll where ever I am. I can send the reports to my boss when he is traveling and everything is so easy to do with the program. I can't think of a single thing I dislike. they have a really great program. It's a great, easy to use product. You will save time and frustration. Payroll use to take me the entire day getting all the reports for a local payroll provider, then I would drive them over to them. On the day before payroll I would receive the checks and would have to double check to make sure there were no mistakes. Just the time saved so I can do other parts of my job is tremendous. Great feedback. Thank you for taking the time to share it with everyone! They always answer my requests RIGHT AWAY, and are very helpful. The inability to "take back" a accidential payroll processing. They should color the Preview and Processing buttons different colors. Also they used to have a thing with GetHired where you could retry the import of a newhire again, and that disappeared in the last few months. Would like that back rather than waiting up to 6 hours for it to do it again. Taxes are done by them and that makes me happy! Thank you for the review, Robert! "Excellent service and easy payroll!" Easily my favorite part of Heartland is my representative and my payroll specialist! These 2 individuals have made the experience with Heartland Payroll a breeze! Beside this the program is so easy! It all boils down to entering the hours per employee and then writing a check. Cannot beat it! I don't really dislike anything about Heartland Payroll. When I took over running the office for a contractor everything had been done old school. I spent all my hours bookkeeping and any time spent on any other project just took too much time away from this necessary task. Heartland has allowed me to have a powerful payroll engine working for me which allows me to focus on other pressing matters. Thank you for the feedback on our incredible customer service! I have used Heartland Payroll for over 8 years. We are a very small business, but still feel that the value we get from HPS more that makes up for the cost. Our payroll specialist, Lauri Lacey, has been professional and responsive. If I have a question or send an email, it is immediately addressed. We have not ever had occasion to consider doing payroll in-house or using another company. Payroll processing and all taxes, forms and filing are done on time. When I have an issue, they figure it out. The only criticism I have is that I no longer have access to my older payroll information since you switched to a new payroll platform. I receive a lot of requests for employment verification and need to refer back to old records for that purpose, as well as payment history, which is now impossible to retrieve unless my specialist puts in a request for each and every inquiry. It is time consuming and inconvenient, as I work many nights/weekends, when your specialists are not available. The tax withholdings is the biggest problem and benefit. Thank you for the positive review of our great customer service! WHAT IS NOT TO LOVE ABOUT HEARTLAND. THEY ARE ALL TOP NOTCH PROFESSIONALS TO WORK WITH. I ESPECIALLY LOVE THE ENTHUSIASM THAT LEE ANN AND JOYCE PUT INTO THEIR WORK. IT MAKES IT A REAL PLEASURE TO DEAL WITH THESE REPS.
No problems with them at all. Having three stores to be responsible for, it saves me a lot of time having them do my payroll, be responsible for filing the taxes, etc. Thank you for the ⭐️⭐️⭐️⭐️⭐️Rhonda! "They have been amazing from day one." The first acct rep I had set up a spread sheet for me to price out various jobs. I have to be able to account for how much money each job is costing me for payroll. I have a commercial cleaning company and have several accounts that staff work every night.They developed the spread sheet and the monthly report so I can see monthly, quarterly, yearly my real costs for payroll per account. My previous payroll company didn't/wouldn't do that. Haven't found anything yet. They are always open to talking about any challenges I may/may not have. Heartland is a company I suggest all the time as a company that can solve problems for payroll, not create them. They have professional and knowledgeable staff that are capable to see a challenge and run with it until it's solved. The biggest benefit was the report they customized for me so I can see how much I'm actually spending on the various cleaning accounts. That has been a major, major benefit and help. Thank you for recommending us to others! So glad we could help you with your spreadsheets. "Efficient and Effective Payroll Services"
I have been a client of Heartland for several years and everything is handled efficiently and effectively. I have had no issues whatsoever and appreciate having a dedicated payroll specialist to make sure everything is done correctly. Payroll is done. Employees are paid on time, and taxes are all submitted and paid as required by law. I don't have to worry that I forgot something. It is able to manage multiple organizations at the same time. Stores personal information well. The format is a bit confusing, not an easy sight to navigate. Also the way time is measured does not make much sense. Adding users is difficult. It also takes a long time to recover funds that were not deposited into a bank account. Make sure you are using actual time, not increments of time. For example, an hour and thirty minutes is displayed as 1.30 not 1.5. Also make sure your employees are on top of things because you won't know if the check didn't hit the bank properly. It will still withdraw from your account. We use Heartland as a way to manage our payroll. It has bee an efficient way to pull payroll reports and labor costs. Great to hear that Heartland Payroll is working for you to securely store personal information and manage multiple organizations at the same time. We appreciate you taking the time to give us feedback on how to improve our services. Your feedback will taken in consideration and sent on to the proper representatives. "Seamless transfer & consistent, top notch service!" The multifunctional dashboard makes it easy to keep employee information in one safe place, as well as retrieve reports easily. Haven't really hurdled any dislikes at this point. Give them an opportunity to show you what they can offer - you may be pleasantly surprised! PTO/Vacations are easy to track! Pretax deductions are clearly listed and easy to keep track of. Hi, Lisa! Thank you for your review, and great to hear the multifunctional dashboard is working great for your business. I can reach a person whenever it is convenient for me. It doesn't matter if our personal representative is on vacation, sick or helping someone else. I have no suggestions for improvement. Everything has been better than expected. The biggest problem Heartland has solved for us is that we no longer need to deal with the IRS for any reason and we are never penalized for a trivial mistake. "Simplest and Efficent Payroll System - Heartland Payroll"
I have the ability to input the payroll in an easy and efficient manner, always have my Associate Payroll specialist available when I need support and I can generate any payroll report anytime. I also appreciate the Human Resources Support - available to me again anytime. I have nothing to dislike about Heartland Payroll. I am pleased with everything. I save time because of the efficient and easy to use system. I am able to generate reports if I need to allocate payroll hours to projects. "I love the Heartland Staff"
Phone system when calling to reach our company rep.
Heartland is worry free and is able to help with all payroll issues and HR situations. Our rep always gets me the answers and results needed ASAP. Their customer service is amazing and the platform is easy to use. Nothing. I've had no substantial problems with payroll and the minor ones always get fixed. You can't go wrong with them. They are responsive and will hold your hand through the whole transition and implementation. I am an HR consultant and use Heartland for 5 of my clients. We use it only for payroll. Their customer service is excellent and their prices are really good. We never have problems. "Simple but lacks convenient functions"
I like how easy it is to complete time entries and process payrolls. I dislike how difficult it is to run reports whether it is an employee census, payroll report or deduction report, they are very hard and confusing to get all of the information you need. Great for simple payroll processing but if you are looking for an all in one HRIS software I suggest looking at other products. Simplifying the payroll process for employees as well as the payment of quarterly payroll taxes. It has been beneficial because it has saved our company lots of time that would have been spent handling quarterly payroll tax and year end tax forms for employees. Thank you for taking the time to give us feedback on our payroll product! We're thrilled to learn how smoothly you're able to complete the time entires and process payroll. We'll make sure to pass along your feedback on the other aspects of the product for future improvements. In this day and age we lack the personal touch way too often. That is why I recommend Heartland to everyone! Angelia has been my specialist at the last 3 Jobs I have run. She goes above and beyond for me every time I call and always does it with a smile!!! They take the headache out of payroll for me. Thank you for the ⭐️⭐️⭐️⭐️⭐️Jenny! Self-service entry and responsiveness from support. And they deal with the federal and state governments. There is nothing I dislike about Heartland. I'm very pleased. I don't have to mail anything and all my payments are direct deposited. Thank you for your review, Vane! We'll pass along your review to our great support team! She is so great, helpful, and knowledgeable. I couldn't do Payroll without her. The online portal is clunky and ugly. I wish this would improve. They are a great payroll partner for my business. It's great to hear about your positive experience with your payroll rep, Colby. Those reps work really hard to help Heartland customers every day. Also, thank you for the feedback on the online portal! "2 years with Heartland Payroll"
During the two years we have been with Heartland, I have experienced great customer service, ease of operation online, and follow through from the staff. I have appreciated the HR tool immensely. Still working on an accurate PTO accrual. At present, I re-enter the allotted PTO at the beginning of each year - usage is subtracted; however, the number as to be re-entered each year. Employee Handbook rewrite. Monthly HR newsletter. The payroll specialist is always available or very prompt in returning calls. She will take the time to walk you through each step and assist in reviewing to make sure everything is correct. The cost to run an extra payroll. Example: want to run a separate check for bonuses and the costs to do this. Having Heartland complete our payroll creates time for our administration to handle other issues. The communication and the fast response. There is nothing to dislike, they have answered all my questions when needed and have taken care of any issues I might of had with great professionalism and courtesy! I realized I do not have to worry about filing the company taxes or worry about any new changes that has to be applied to payroll. They take care of everything. I love how easy it is to use and I love the customer service I always receive. 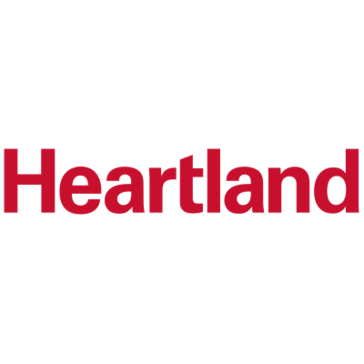 I can't think of any problems I've had with Heartland that would cause me to dislike anything. Heartland Payroll takes care of paying the employees and filing any tax requirements on a State and Federal level. I don't have to try and figure out taxes and social security. Hard to say. It meets expectations. Direct deposits are made on time. Quarterly reports are submitted in timely manner. No issues with 401k submission reports. It is not easy to navigate through the system. There is no "search" or "help" module when needing assistance. I am saving time processing payroll checks, quarterly report filings, and year-end W2 and 1099 reporting. "Mostly helpful staff and easy to use!" I appreciate the ease of using the online dashboard. I dislike how long it has taken to have the properly quarterly employment forms filed with our state. Use your resources within the organization so you can make sure you are taking advantage of everything possible for your business. Year end taxes are a lot easier with everything completed through Heartland. "Outstanding service with awesome customer support is what Heartland Payroll is all about"
Customer service is why I have used Heartland Payroll for over 15 years. Walter, we are honored to have earned your business and trust over the past 15 years. Thank you so much for your continued patronage, and for taking the time to leave us a ⭐️⭐️⭐️⭐️⭐️review! "Heartland makes payroll very easy, 30 checks done in 30-40 minutes!" Online interface is very user friendly, I have my own dedicated support specialist and have never had an issue that went unresolved. Payroll comes in overnight freight and has always showed up as promised even through inclement weather. The ability to move from employee to employee through various lists can be slow. Accurate payroll, a vast battery of reports available online at any time. We don't have to waste time staying up on current payroll rates/rules/regulations. We save time by simply being able to plug in hours and deductions. The expense incurred by using Heartland is very reasonable also. I like that we have a specific customer service representative. In the past, we just had to call customer service with our old platform. We never knew if the information we were told was accurate or not and half the time it wasn't! We don't have that issue with Heartland! I honestly can't think of anything I dislike. Maybe the only thing is that we don't have the history because of the fact we switched, but that's not Heartland's fault! Switch! It's totally worth it! Switching to Heartland saves us time in managing our payroll and HRIS structure! The customer service & account reps are outstanding. They answer any questions quickly and effectively. I don't have a single complaint thus far. 100000% recommend. Extremely easy, saves time, customer services/account reps are extremely helpful and responsive..
Heartland handles my credit card processing and payroll. It's extremely easy and saves me a ton of time with invoicing and nonsense paperwork. I don't like the way it shows the additional hours because it lumps them together instead of having the hours listed separately. Payroll and Reporting. The benefits are the software is easy to use and the reporting gives us everything we need. Also the customer service is amazing. Great to hear! Thank you, Debi! "Very happy with personalized customer service." The ability to get an American human on the phone immediately, to support me. And, my rep, Michelle, is always looking out for us... She will remind us if we have not submitted payroll! The web application needs updating badly! I can easily and affordably process payroll and remove this burden from my very small staff. Thank you for the feedback! We'll pass along the kind words to Michelle. Simple, common-sense way to do payroll. Screen flows make sense and it saves TIME, the most precious commodity that I have. There is nothing I dislike about Heartland Payroll. Easy to set up, great support from company, and easy to use. Try it! Considering how precious a commodity time is for you, Robbie, we can't thank you enough for taking a little bit more time out of your day to leave us such a great review. Thrilled to hear your happiness with our payroll services and user experience with the product. I really do not dislike anything about the service I receive from Heartland. "Very pleased with the quality of service provided"
Heartland consistently provides quality service at all levels. Their response to customer inquiries or requests for assistance is exceptional. I am frequently contacted by other payroll processing companies but I would never consider switching to another company. Heartland is just too good at what they do. i cannot think of one thing that I would want them to change. There is nothing that we dislike about Heartland. Sign up with Heartland. They do not disappoint. Consistently excellent and accurate service. I like that my rep is always available to help. Wish there was a mobile app for me to submit payroll on. Would like to be able to use it on my iphone or on the ipad. Helps me keep payroll organized. Thank you for the review! We'll gladly pass along your suggestions. The system is well organized, so fairly intuitive to manage. And when I need help, our payroll specialist is always friendly and helpful. Payroll processing and tax reporting/paying. Ever step is efficient and is always timely and accurate. I have ever had a negative experience with Heartland! I can count every week, month, quarterly and end of the year accounting to be accurate! Janisse, you summed it up perfectly with "Trustworthy." Thank you for helping us spread the word about our consistent goal to put forth a professional and trustworthy product and service. Thank you! Friendly and capable staff; Checks are always delivered on time. Ron, your "Strongly recommended" review is exactly what we strive for every day. Thank you for taking the time to let us know that we always deliver on time for your company! No more keeping up with always changing payroll regulations. Nothing at all. Leave the payroll to them! * We monitor all Heartland Payroll reviews to prevent fraudulent reviews and keep review quality high. We do not post reviews by company employees or direct competitors. Validated reviews require the user to submit a screenshot of the product containing their user ID, in order to verify a user is an actual user of the product. Hi there! Are you looking to implement a solution like Heartland Payroll?